FDR and Al Capone's Cadillac; Truth or Myth? Al Capone's 1928 Cadillac on display in England. After several years of getting emails from viewers who peruse these Capone pages I decided to be one of the first in taking a deeper look into the matter. Myalcaponemuseum takes pride in weeding out the facts from fiction and bring only the facts to truth seekers. I have seen the FDR/ Capone caddy reference popping up on many sites since 2011, some of them reputable sites (CNN, CBS, The New York Times, The Daily Mirror etc...). I'm glad to see other sites now jumping on the bandwagon to help stop the further perpetuation of this myth. It was just recently mentioned as fact on the History channel's "The United Stuff of America" and "Lost History". It was also mentioned on many car websites and other Capone related websites. All accept this as fact. After some research, here is what I found. On November 20th, 1971, Al Capone's known 1928 Cadillac was sold at auction for $37,000. It was at this moment that this 1928 Capone Cadillac was again mentioned as also being the one used by President Franklin D. Roosevelt. This was probably done by the car owner or auction house who did faulty research and also perhaps in order to boost the sale of the car by having two historical figures tied to it. Researchers and authors from then on believed what they read and connected this Caddy's sales history from newspaper stories along with Michael Reilly's 1947 book embellishements. Sadly, this has now become accepted as historic fact. The FDR /Capone story was originally started by Michael F. Reilly, who was Franklin D. Roosevelt's Secret Service man. In 1947, he was sharing his memoirs to Simon Schuster in order to have his story published for a 1947 book called "Reilly of The White House" and later in 1958 for "Treasury Agents". Excerpts were published in newspapers around the country for both book releases to entice the readers in buying the book. Some budding authors pick up on this during research and perpetuate it in their works. 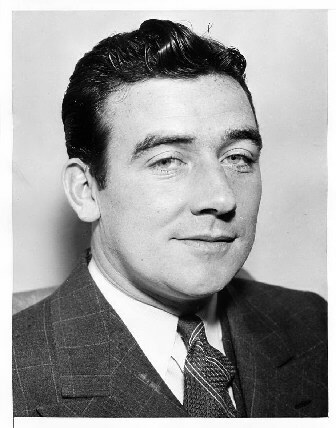 FDR Secret service agent Michael Reilly. Reilly mentions the dire need to protect the President after the attack on Pearl harbor and that the Government at that time could not spend anymore money on cars. They had supposedly impounded Capone's armoured vehicle once he went to prison and decided to use it for the President's protection after December 8, 1941. Many authors and news stories through time now have the Capone caddy enroute from the White House to FDR'S destination in front of Congress for his Day of Infamy speech. This was to give his famous Pearl Harbor speech declaring war on Japan on December 8, 1941. Here is an exerpt from Michael Reilly's "Reilly of the White House". declaration of war against Japan. delphia, and other Eastern cities. to spend the rest of the war in hiding." "Mr. President, I've taken the liberty of getting a new car. it has a dubious reputation." in the subsequent legal complications. I got it from Treasury." teresting. I hope Mr. Capone doesn't mind. How does it work?" Because of this **** I wasn't very pleased with the Capone wagon. ten dollars a week. " **** Why did Reilly say these fabled things? My guess is either he may have gotten his facts wrong or as with Oscar Fraley and Eliot Ness, it may have been in the best interest of the book he was having published to throw in the Al Capone connection and embellish the story so to speak. Google "Al Capone" in the news section of Google and you will see the name of Al Capone thrown in with every conceivable news story out there! The name Capone really helps get your attention. 1) As erroneously reported by many authors and news outlets, the real Capone Cadillac doesn't match the Presidential Cadillac car taken in a photo on December 8,1941, enroute to Congress. For that matter, none of Capone's known two Cadillacs match the Presidential Cadillac leaving the White House December 8,1941 or any photos shown of FDR motorcade after that date. The Capone car being used by FDR on the day of his famous speech (December 8th, 1941) was a rumor started by later authors who got the Michael Reilly story wrong. This has been perpetuated over the years right up until today. 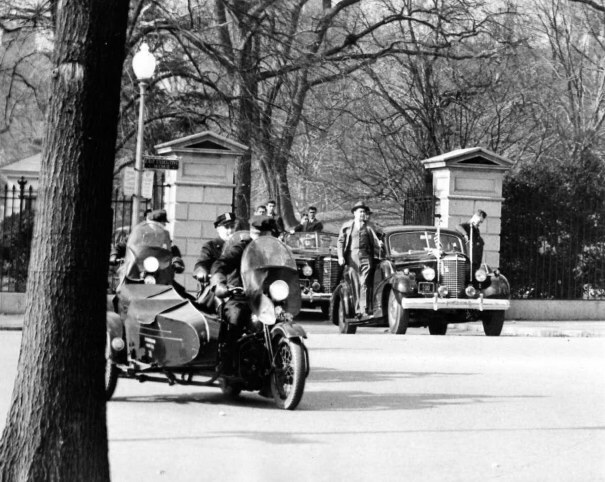 Car on the right with flags is FDR's Cadillac leaving the White house for Day of Infamy speech at Congress on December 8,1941. This photo disproves many books, news media outlets and websites perpetuating the myth that Capone's 1928 V8 armoured Cadillac was used to transport the President to his famous "Day of Infamy" speech. This was not Al Capone's armored Cadillac. For comparison. Left to right; FDR's car used before and after infamy speech, Al Capone's known verified 1928 V8 Cadillac and a supposed Capone rebuilt 1931 V16 armoured Cadillac. 2) In 1939, Capone had just left prison and had the mind of a 13 year old, so the angle that the Cadillac was probably a later model than that of 1928 is unfounded. Capone was in prison from 1932 to 1939, was financially strapped and was in no position to purchase any armoured Cadillacs while incarcerated. His mind had regressed by that time to one of a 13 year old child. **** 3) While Michael Reilly did not state in his memoirs that a Capone Cadillac was used on the 8th of December 1941 to transport the President to his "Day of Infamy " speech (he mentions it to be a day later on the 9th), he does make blatant erroneous statements about the supposed Capone car that was used. According to Michael Reilly's book of memoirs, he claimed he was displeased with the Al Capone car because it wasn't a closed car? In actuality, Capone never owned or rode in armored open roof (convertible) bullet proof automobile! His two known armored cars were all closed. What's the point of a gangster with many enemies owning an open roofed armored car? Makes no sense as Capone could get easily shot in the head from the rooftops or have a hand grenade tossed in the car. This further disproves the rumor that FDR ever used Al Capone's 1928 caddy. The description and dates just do not jive. 4) In 1933, the real 1928 Capone Cadillac was sold and shipped to England and didn't return until 1958. It went to the new owner who ran an amusement park overseas. After U.S. pressure to stop glorifying gangsters, the owner soon tired of the car and sold the Cadillac to dance hall owner Tony Stuart. If the U.S. Government was pressuring Britain to stop glorifying gangsters with display of the Capone car then why would the U.S. Government condone the President riding in any known gangster car? This would defy any logic. Also, you would think since the President was constantly eyed upon, this by the press and public that someone would have a taken a photo of him in or near Al Capone's famous car. 5) Nobody at the Franklin D. Roosevelt Library has any photos or documents showing that the 1928 Capone Cadillac was ever used by FDR. They claim this was made up by Michael Reilly. 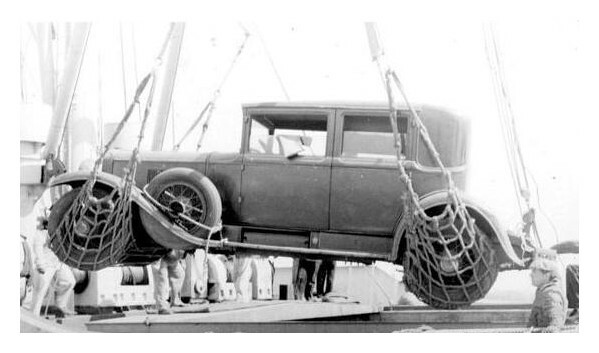 Capone's 1928 Cadillac being loaded up and shipped to England 1933. 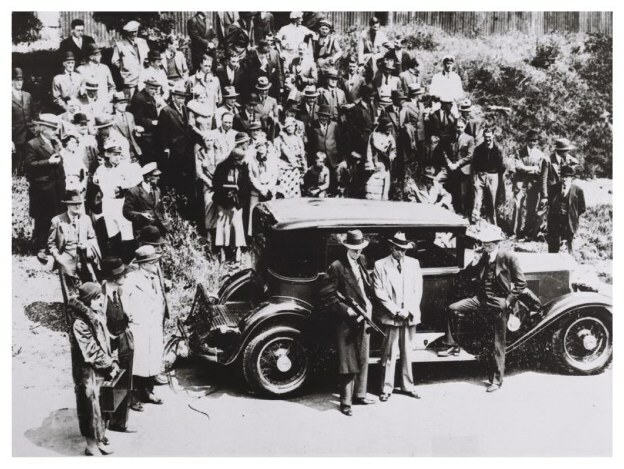 Capone's 1928 Cadillac being demonstrated (with fake thompson and gangsters) to the crowds in England at a carnival sideshow in the mid to late 1930's. 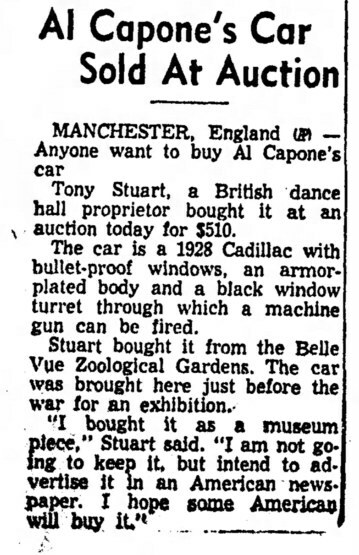 The Capone car stayed in England until 1958, Tony Stuart bought it in hopes to immediately resell it to an American. His wish didn't come true when it was eventually sold and shipped to Harley Neilson of Toronto Canada. So you can now see that this car featured in the news and storybooks never had the chance to drive FDR around Washington at any time. April 28,1958. Car is bought up by Chocolate magnate Harley Neilson. 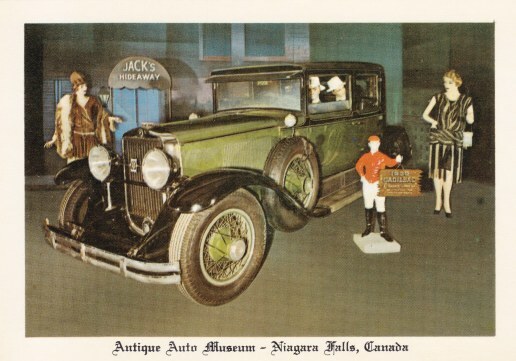 The 1928 car was then sold to the Niagara falls museum in the late 60's. Al Capone's 1928 armoured Cadillac on display at Niagara falls museum, Canada. This is more what FDR was riding in that day. This is an example of a closed 1940 Cadillac. The White House had plenty of cars in wait as the "Sunshine Special" was being retrofitted by Ford. FDR had also during this time at his disposal two 1938 Convertible Cadillacs nicknamed the "Queen Mary" and the "Queen Elizabeth". Then why say they used a world reknowned criminal's wheels? 2) It makes a good story that sells books and shows. 3) If It comes out of the mouth of a Secret Service man, then you know it must be true. This is the documentation below that was offered at auction explaining the provenance of the 1928 Capone car. Thorough documentation begins with the purchase of this car by Mr. Harry LaBreque in May of 1933 from Mr. Patrick Moore, of 37 Grove Street in Rockville, Connecticut. The RM research team was able to locate Mr. Moore's only surviving descendant, Mrs. Pat Denning, who recently discussed her parent's brief ownership of the Cadillac. According to Mrs. Denning, her parents purchased the car from an agent in Chicago, with whom they believed it had been placed by Capone. The Moores worked with a traveling carnival in the summer and owned the car for "about a year," including a full summer, when they exhibited the car with the carnival. This information dates their purchase from the agent to the spring of 1932. The Moores intended to use the car as a standalone exhibit to make extra money during the winter off-season. The plan did not work as intended; thus, the car was sold to LaBreque. Mrs. Denning also noted that her parents did not have a permanent address during this time; the given address in Rockville was actually her aunt's address, and in 1930, they were actually in Peoria, Illinois. She further stated that it is unlikely that the car was ever brought to Connecticut and that it would not have been registered, more likely traveling on a trailer covered up to preserve its condition and to exclude viewing until patrons had paid to see it; this is consistent with a statement later made by LaBreque, stating that he purchased the car in Chicago. "I asked him where he got his 1950 Cadillac, and he said `Denemark.' This fellow, Gioe, bought his at Denemark's. Campagna, for the first time in his life, bought one at Joe Bergl's instead of Denemark's, but he always did business with Denemark before...these fellows evidently did business with Denemark when they purchased their cars." Among Mr. Denemark's clients was Alphonse Capone. An article published in The Milwaukee Sentinel on December 22, 1931 headlined that one of Capone's two V-16s had been used to chauffeur Warden David Moneypenny of the Cook County jail. 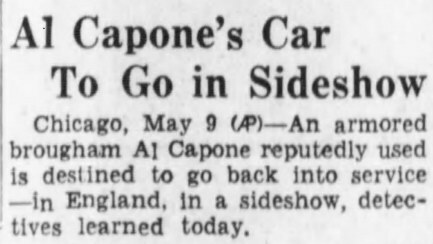 The headline reads, "Al Capone's Car Carries Jail Warden" with the skeptical subhead, "Chicago-Springfield Trip Divergently Explained." In the article, Denemark stated that he sold Capone two V-16s and that the car used to transport Moneypenny no longer belonged to Capone because both had been repossessed for non-payment. Given Denemark's apparent longstanding good relations with organized crime, and the fact that Capone was one of the most dangerous men in Chicago, it is likely, as the reporter evidently believed, that Denemark was simply trying to save face for Big Al. "For a time, it looked as though the restrictions the government put on visitors calling to see the gang chief in the county jail would operate to keep his creditors away, but at least one of them got permission from federal authorities to talk to him. He was Emil Denemark, a politician and dealer in high priced motor cars, who said he wanted to speak to Al about the remaining payments due on two expensive automobiles." Denemark's unusual level of access and long involvement with underworld figures suggests that their business involved more than automobile payments. The timing of these events, as they relate to Capone's legal issues, is critical. Capone was convicted on October 18, 1931, sentenced in November, and had a rehearing of appeal denied in March of 1932, with his sentence at Atlanta U.S. Penitentiary beginning on May 4, 1932. A lengthy report addressed to the Intelligence Unit Chief of the Bureau of Internal Revenue states that Capone was caught in October 1931 attempting to sell his home in Florida, along with two yachts and other items, for $150,000 cash. One of the sixteens is mentioned among other vehicles; given that these two sixteens had made their way into the headlines and grabbed the attention of the Feds, the older, armored Model 341A sedan was evidently overlooked while it lay quietly tucked away in a Chicago garage. The timing and circumstances strongly suggest that the car was consigned to the agent at the behest of Capone, as Mrs. Denning was led to believe, and that agent was Emil Denemark. The ownership history after the purchase by LaBreque is well-known and heavily documented. He purchased it for Capt. de Forest Morehouse over in England. After being shipped to New York and shipped to England, it was displayed at the Southend-On-Sea amusement park and later at the Blackpool Fun Fair in Manchester. Dance hall owner Tony Stuart purchased the car for $510 at an auction in February of 1958 and sold it months later to Harley Nielson, a businessman and car enthusiast from Todmorden, Ontario. Neilson undertook a comprehensive restoration, and in the process, most of the heavy armor plating was removed, but other features, including the bulletproof glass and drop-down rear window, were retained. In a Letter to the Editor of Esquire, Neilson explained that in 1939, the U.S. government asked the British government to intervene and take the car off display because of the "poor public relations it could cause by pointing up American Gangsterism." On April 15th, 1958, a photograph published in the Toronto Globe and Mail shows the Capone Cadillac being prepared for shipment to Canada after its purchase by Harley Neilson, a Toronto-area businessman and car enthusiast. Although solid and virtually complete, the car had not run in years, so Neilson undertook a comprehensive restoration. Most of the heavy armor plating was removed, but other features, including the bulletproof glass and drop-down rear window, were retained. Neilson retained the car for several years before selling it to the Niagara Falls Antique Auto Museum in the mid-1960s, where it remained until November 20th, 1971, when the museum was liquidated by public auction with nearly 50 cars sold. Among them was the Capone Cadillac, which drew $37,000. 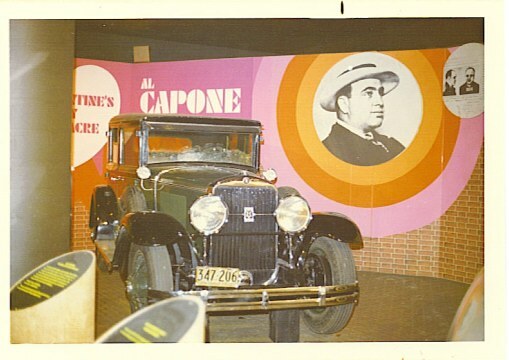 Postcard of Capone's 1928 Cadillac at the Antique Auto Museum Niagara falls Canada circa late1960's. The buyer, as confirmed by a 1973 Ontario registration, was Peter Stranges of Niagara Falls, Canada, who co-owned the Cars of the Greats museum. In February 1975, they offered the car at auction in Atlantic City, New Jersey, reportedly turning down $81,000 and insisting they wanted closer to $100,000 before selling. Stranges then arranged to have the car shipped to Chicago for the launch of the movie Capone on April 14th, 1975, where it generated national publicity. Finally, on January 13th, 1979, the "Cars of the Greats" collection was sold and B.H. Atchley, owner of Tennessee's Smoky Mountain Car Museum, purchased the Cadillac. Atchley freshened the restoration, and since the original glass was heavily crazed and deeply yellowed, a specialist supplied replacement glass of identical size and thickness. In early 2006, the Cadillac was again sold and joined the collection of the late Mr. John O'Quinn. An Emil Denemark mechanical pencil. All of Al Capone's Cadillacs were purchase at Emil Denemark's Cadillac dealership at 3860 Ogden. Denemark had alleged shady dealings with the Capone gang. Although Capone had amassed a certain amount of wealth during his reign as gang czar of Chicago, his personal net worth may have been exaggerated somewhat. The huge amounts of money made by "The Outfit" belonged and was spread amongst "The Outfit". Capone's share as CEO was a very sizeable one. Problem was Capone spent it as fast as in came in. Thinking the flow would last forever, Capone was spending lavishly. He was a very bad gambler and spender, buying booze, food, funding many parties, women, hunting trips, personal trips while doting on his son, wife and family. Capone mostly bought big ticket items under his wife's or mother's name. ( Two houses and a couple of cars). He did buy some things outright to his name that were brought up in his trial. Things like jewelry, furniture and renovations to his Miami home. For the cars, only 4 are bonafidely linked to Capone through court financial statements and witnesses. Two McFarlans (a 1924 and a 1926), one of which was traded in for the other. Both McFarlan automobiles were purchased at G. C. Auto, which later became McFarlan Motor Co. situated at 1217 Morse avenue. Mr. C. Buxton testified at Capone's tax trial as having sold the two cars to Capone. Capone doled out the down payment cash and the licenses were all in Mae Capone's name. On May 18,1928, he purchased a 7 passenger Lincoln sedan from S&L Motor Co. He plucked down $5,380 for it. He purchased another in 1929 and one more in 1930. 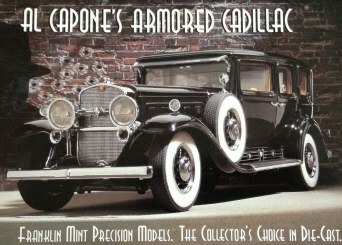 Only two Capone cars were known to be armored, the 1928 and the 1930 Cadillacs. 1931 signaled the downfall of Capone through his tax trial and he was no longer in the buying mood. The Treasury men where raiding his booze operations and what was left of his money was being eaten up by his lawyers for his income tax trial. Capone's other car was a V16 Cadillac that was seized by authorities. It was registered under Mae Capone's name and documents showed that payments were still owed to Emil Denemark Cadillac.That Cadillac had made the news when on December 14,1931, Cook County Warden David Moneypenny had unknowingly used the car for a trip to Springfield as a witness for a parole board hearing. This car was then used from 1932 to 1936 at various film promotions such as Scarface, and other gangster movies. 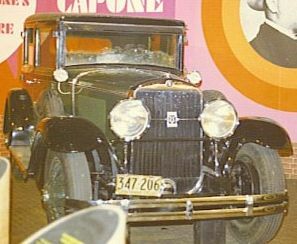 Capone's 1930 16 cylinder Cadillac at movie theatres in the 1930's. Many rumors of Capone owning houses and cars all over the U.S. and Canada. None are founded on proof. The fact was Al Capone during his incarceration had a hard time keeping up the payments on the Miami home and the few cars they owned. Most were reposessed and after Al's death Mae had to sell the cars and eventually the Palm Island estate. Sonny and Al Capone in Florida standing next to the Capone family 1928 Packard. Most were owned by Mae or other family members. According to some viewers of the Jay Leno's Garage series, there recently was an episode when Jay visited the Secret Service department. 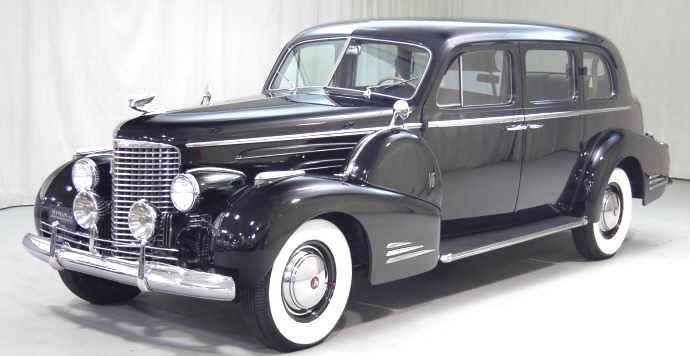 There according to Special Agent John Ryan Leno was informed that it was actually a 1939 Packard and not a 1928 Cadillac that was seized from Al Capone. According to the agent once the vehicle was impounded, the government officials had observed that the windows were bullet proof (not the body). That’s when the car was used by President of the United States Franklin Delano Roosevelt for protection. Well that's all nice for the cameras, but the story still doesn't hold much water. We need specifics for which they do not give. 1) Al Capone was in prison from 1932-1939. He left prison in November 1939. 2) He couldn't have bought any bullet proofed glassed car or any other cars for that matter while incarcerated (1932-1939). 3) By the time he left prison he was reduced to acting like a 12 year old child. He was very sick and hardly made it back home to Miami by car in 1940. How could he make a bullet proof car purchase? 4) The Capone's owned their house in Miami and in Chicago which would have been better for seizure for back taxes if the Government was seizing anything of value at that time, but they never seized those. Why? They couldn't seize any of them because none of the homes were under Al Capone's ownership. I do not believe that a mentally unstable Al Capone left prison then visited a car dealership and bought a Packard convertible to which he signed his name as ownership, not only that but then having it customized to have bullet proof windows installed?? There are also no accounts of the Government seizing an Al Capone car in 1939. 5)In November 1939, Al Capone made it to from prison to train station and then to the Baltimore hospital with government agents in their own vehicle. Al Capone in a Government car (Hardtop) leaving the train station at Harrisburg, PA in 1939. 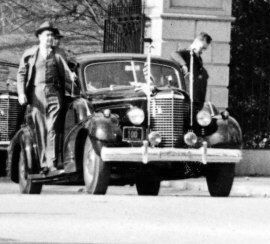 6) Even if the account is to be believed that a supposed Capone 1939 convertible Packard was driving around the President in 1941, then why is photo of the car driving the President to Congress for his infamy speech not match the account of the Secret Service agent (Cadillac or Packard convertible)? Car to the right bringing Franklin Roosevelt to Congress in 1941. It's a hardtop Cadillac, not a Packard. My take is the info may be erroneous. If there is any truth to the Secret Service story, it is that a convertible car that was once used to transport Capone by the Government may have been also used by the President, but not a 1939 Packard personally owned by Alphonse Capone. Even that to me is far fetched because the cars I have seen Capone transported in by law officials were all hardtops and not like the photo that was shown on Jay Leno's Garage show. Again, the burden of proof lies strictly with the Secret Service in providing photos and info on said Capone bulletproof Cadillac used by FDR. My special thanks to Cadillac expert Mr. Yann Saunders at the Cadillac Database, crime author Allan May, Truth or Fiction's Tony Ashlin and The History Insider blogger Ray Grasshoff. All of whom piqued my curiosity to create this webpage.